Join us in celebrating the new creators of our media future. Experience live & interactive evidence of the power of World Building. Create a world in a day! USC | 5D Institute is staging the first Science of Fiction one-day World Building festival, at USC on April 13th 2013. Teams that include leading theorists and practitioners from a wide spectrum of creative and scientific disciplines will join with SCA student innovators who are creating on the bleeding edges, and in the spaces in-between. Using the narrative design principles of World Building, these open and revolutionary minds will work together to create an alternate visionary world, a near future fiction that might also lie just around the corner. This unprecedented event will launch a unique and persistent world that will continue to evolve in transmedia projects at USC and 5D Institute, and in the real world. This immersive art science festival will give in-person and online audiences the opportunity to participate, provoke and parse the process through integrated social media. 5Di: The Science of Fiction will be live streamed and video archived. The present and future leaders of our shifting cross-media landscape will leave this festival with a first-person perspective on the practice, strategies and technologies for the creative development of narrative media through 21st Century World Building. Attendees will also be able to enjoy Evidence - a World Building mediated exhibit; Hunger In LA a real-time immersion into a virtual documented world by artist Nonny de la Pena; all day (Science of) Networking; and an evening performance; and Sound of Fiction featuring some of LA’s top musical innovators taking the stage at Bootleg Theater to close the festival (separate entry). 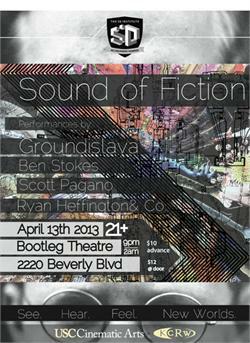 The Science of Fiction will launch at 9am on Saturday April 13th, at the Norris Theater, USC, Los Angeles. See website for further details. Subsequent events during the day will take place at the SCI Building, School of Cinematic Arts - participants and audience will be directed from the opening keynote and introductions at Norris Theater to the new building. We'll reassemble at Norris Theater for the close of the afternoon. Buy your tickets for the Science of Fiction here: Eventbrite. Early bird special: the first 75 people that buy tickets for Science of Fiction will get free entry to the Sound of Fiction evening performance event (below), before 10pm. Join us for a one night celebration of new sonic innovators. Curated by Vanja Alispahic. Visit our facebook page for further details. Transmedia, Hollywood 4 tickets now on sale! This year’s Transmedia, Hollywood 4 conference will be held from 9 AM to 6 PM in UCLA’s James Bridges Theater on April 12, 2013. Visit Transmedia, Hollywood.